F U N . I N S P I R I N G . C O M M U N I T Y . 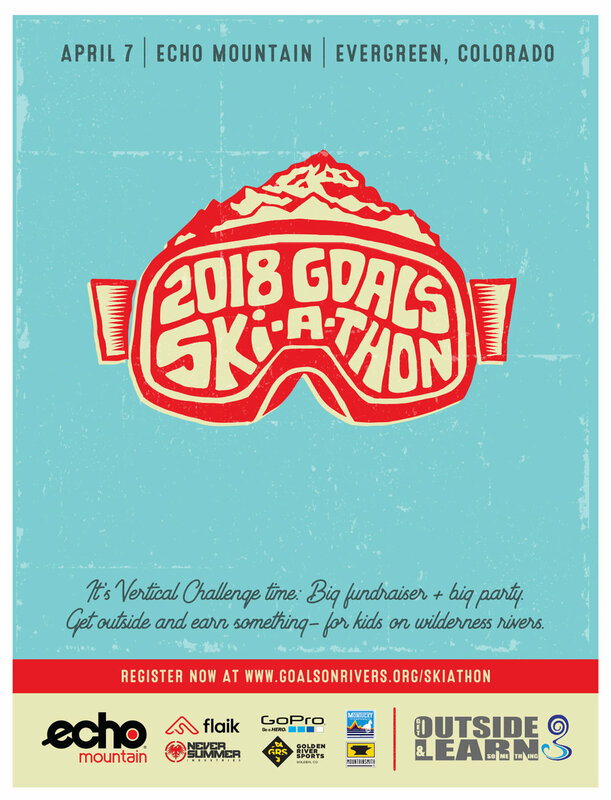 C E L E B R A T I O N .
Those are words we want the people who participate in our 2018 ski-a-thon to use when they look back on the event. As such, we're making some changes to this year's campaign. More than Just a new name. Rather than the "event" itself being centered around skiing or riding as many vertical feet as you possibly can, we're changing the entire feel of what used to be called "The Vertical Challenge." It is being replaced by a focused, 50-day campaign that can - and should - be used by every GOALS supporter to raise funds in support of our mission. We will then gather on Saturday, April 7 for a celebration of what we've accomplished together at Echo Mountain - our hometown ski hill. We're thrilled to partner with Echo in designing a community-oriented, family-friendly event featuring fun on- and off-slope activities that incorporate river games and traditions from GOALS expeditions. We'll have an ongoing kubb tournament and bocce in the snow, a slalom course for those who's like to challenge their friends, and even a coordinated costume run toward the end of the day with all skiers heading downhill at the same time, just like "costume night" at the end of a river trip. Once again, we're rewarding those who fund raise most aggressively this year with impressive prizes - but in 2018 they're guaranteed, based on the amount you raise. Furthermore, we'll be giving away loads of swag every hour from our corporate sponsors. Our intent is to make this crucial campaign more inclusive - involving everyone who wants more kids to grow outdoors on wild rivers. We hope you'll one of them - skier or not - local or not. This is our time to work as a community toward empowering a cause we feel is important. 1. Create a team. If you're one of our most motivated supporters, you'll captain a team and motivate friends to join you. They've got friends you don't know - and can connect them to GOALS. 2. Join as an individual. Create your own page, then share it far and wide. 3. Give generously. Support someone you know as they try to reach their fundraising goal. In the end, what matters most isn't HOW you participate - but THAT you participate. Since 2010, no interested child has ever been prevented from participating in a GOALS expedition because they couldn't afford it. We plan to keep that streak alive, and need EVERY motivated supporter to spread the word, raise money, then come celebrate with us on April 7. Don't wait - create your page now!